The Sopranos Bellman エピソード: "Remember When"
Modern Family Guillermo エピソード: "Good Cop Bad Dog"
2012 Submissions Only Auditioner #1 エピソード: "Another Interruption"
Smash Himself エピソード: "The Transfer"
How I Met Your Mother Gus エピソード: "Bedtime Stories"
2016 Inside Amy Schumer Himself エピソード: "The World's Most Interesting Woman in the World"
2016 Last Week Tonight with John Oliver Himself エピソード: "Puerto Rico"
2016 Difficult People Himself エピソード: "Carter"
Saturday Night Live Himself (host) エピソード: "リン・マニュエル・ミランダ/トゥエンティ・ワン・パイロッツ"
2016 Drunk History Himself エピソード: "Hamilton"
2017 My Brother, My Brother and Me Himself エピソード: "Candlenights & Vape Ape"
エピソード: "The Old Sugarman House"
Brooklyn Nine-Nine David Santiago エピソード: "The Golden Child"
^ Mead, Rebecca (2015年2月9日). “All About the Hamiltons”. The New Yorker. ISSN 0028-792X. オリジナルの2017年9月30日時点によるアーカイブ。. https://web.archive.org/web/20170930211838/https://www.newyorker.com/magazine/2015/02/09/hamiltons 2016年12月25日閲覧. "The composer of 'In the Heights' grew up not in Washington Heights but thirty blocks farther uptown, across from Inwood Hill Park..."
^ McPhee, Ryan (July 19, 2018). “Lin-Manuel Miranda to Direct Film Adaptation of Tick, Tick... BOOM!”. Playbill. オリジナルの2018-07-19時点によるアーカイブ。. http://www.playbill.com/article/lin-manuel-miranda-to-direct-film-adaptation-of-tick-tickboom. ^ a b Fleming, Mike, Jr. (July 19, 2018). “Imagine Sets Lin-Manuel Miranda's Helming Debut: Rent Creator Jonathan Larson's Tick, Tick... Boom! ; Evan Hansen's Steven Levenson Scripting”. Deadline: Hollywood. オリジナルの2018-07-19時点によるアーカイブ。. 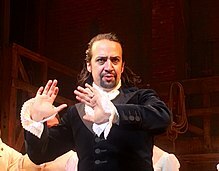 https://deadline.com/2018/07/lin-manuel-miranda-directing-debut-tick-tick-boom-hamilton-jonathan-larson-steven-levenson-imagine-entertainment-musical-movie-1202429317/. ^ Miranda, Lin-Manuel [@Lin_Manuel] (2018年2月2日). "Int. Hospital Room. Night. [The screams reach a delirious crescendo. FRANCISCO MIRANDA enters. He is 7 pounds and 13 ounces.] Intermission" (ツイート) – via Twitter. ^ Miranda, Lin-Manuel [@Lin_Manuel] (2015年5月4日). "Sometimes you run into your famous rapper cousin in the street" (ツイート). Retrieved 2016年7月11日 – via Twitter. ^ Miranda, Lin-Manuel [@Lin_Manuel] (2016年2月4日). "The greatest rapper in the family came through tonight...@Residente aka mi primo René!" (ツイート). Retrieved 2016年7月11日 – via Twitter. ^ Miranda, Lin-Manuel [@Lin_Manuel] (2011年9月29日). ""@belisa78: @Lin_Manuel are u and Rene from Calle 13 really primos or did u mean it like brother or buddy?i MUST know!" 3rd cousins" (ツイート). Retrieved 2016年7月11日 – via Twitter.